Paper. IX + 302 folios. Ca. 22.5 x 15.0 cm. Italy-Hungary-Nuremberg, ca. 1462-75. Foliation and hands: Quires 1-17 marked in brown ink by Regiomontanus, 18-24 in pencil (not by Regiomontanus) on the top right of the first folio of each gathering. Paginated in pencil at top with a total of 573 pages (by 1801), canceled in pencil (after 1960). Foliated in pencil at lower left (by 1940), with a total of 296 folios. Foliated in pencil at upper left (after 1960), with a total of 302 folios, including front cover, skipping 19, and excluding 4 blank leaves after f. 36, 2 blank leaves after f. 268 and 3 blank leaves after f. 302. Our edition uses the most recent foliation. Unlined textblock, ca. 16.5 x 8.0 cm. 32-35 lines. Humanistic hand, Regiomontanus autograph, except for f. 40r-v (copy of George of Trebizond’s dedication of his Commentary on the Almagest to King Matthias Corvinus) in a different humanist professional hand, and f. 44, a singleton taken from Murr’s 1801 Notitia trium codicum, his printed copy of a diagram and text from f. 43r. Fig. 1: Spine of the manuscript, as photographed in 2002. Provenance: Murr ex libris (Me possidet C. T. de Murr. A. 1800.) on front cover, f. 1r. Regiomontanus ex libris (cross on mountain with two stars), f. 2r. Stamped seal of the Imperial Moscow University, f. 2r. Purple stamp of the Academy Archives, ff. 1r, 2r, 42r (singleton glued to f. 43), 175r (singleton glued to f. 176), 291r (singleton glued to f. 292). Quires and paper: Quire 1 (XI), ff. 2-24 (f. 19 skipped), initial R watermark on ff. 2/24, 4/22, 7/18, 9/16, 10/15, and 12/13. Quire 2 (IV), ff. 25-32, ox head with seven petals (a) watermark on ff. 28/29. Quire 3 (IV + I + 3), ff. 33-36 plus 4 unfoliated blank leaves, ox head with seven petals (a) watermark on ff. 33/, 34/, 36/; ff. 37-39, a bifolium plus singleton (preface to Defensio, Regiomontanus autograph), ox head with six petals watermark on ff. 37/38; ff. 40-41, two singletons with balance in circle (a) watermark on each. Quire 4 (3+VI), ff. 42-56,  f. 42 a singleton (13.0 x 11.5 cm) glued to f. 43, no watermark visible; f. 43, a singleton, balance in circle (a) watermark; f. 44, a singleton added by Murr (his printed copy of a diagram and text from f. 43r), glued onto f. 45; balance in circle (a) watermark on ff. 45/56, 46/55, 48/53. Quire 5 (VI), ff. 57-68, balance watermark on ff. 57/68, 60/65, 61/64. Quire 6 (VI), ff. 69-80, balance in circle (b) watermark on ff. 70/79, 72/77, 74/75. Quire 7 (VI), ff. 81-92, balance in circle (b) watermark on ff. 81/92, 84/89, 86/87. Quire 8 (VI + 1), ff. 93-105, balance in circle (c) watermark on ff. 93/105, 94/104, 98/101; f. 96 unattached singleton (13.5 x 14.7 cm) with “bulls eye” mark that matches mark on f. 97r, balance in circle (b) watermark. Quire 9 (VI), ff. 106-17, balance in circle (c) watermark on ff. 107/116, 109/114, 110/113. Quire 10 (VI + 1), ff. 118-30, balance in circle (c) watermark on ff. 118/130, 119/129, 122/126; f. 125 unattached singleton (11.0 x 15.0 cm), no watermark visible. Quire 11 (VI), ff. 131-42, balance in circle (c) watermark on ff. 133/140, 134/139. Quire 12 (VII + 1), ff. 143-57, balance in circle (c) watermark on ff. 143/157, 145/155, 149/152; f. 146 a singleton (5.5 x 14.5 cm) formerly glued to f. 147 but currently detached, no watermark or chain lines visible. Quire 13 (VI), ff. 158-69, balance in circle (c) watermark on ff. 160/167, 163/164. Quire 14 (VI + 2), ff. 170-83, ox head with six petals watermark on ff. 171/182, 173/179; two unattached singletons, f. 175 (2.5 x 12.0 cm) attached to f. 176, and f. 181 (13.0 x 16.0 cm), both on similar paper with no watermarks or chain lines visible. Quire 15 (VI + 1), ff. 184-96, ox head with six petals watermark on ff. 184/196, 187/193, 190/191. Singleton, f. 188, no watermark or chain lines visible, looks similar to ff. 175, 181. Quire 16 (VI), ff. 197-208, ox head with six petals watermark on ff. 198/207, 199/206, 201/204. Quire 17 (VI), ff. 209-20, ox head with six petals watermark on ff. 210/219, 211/218, ox head with five petals and triangle watermark on ff. 213/216. Quire 18 (VI + 1), ff. 221-33, ox head with five petals and triangle watermark on ff. 221/233, 224/229, 225/228; f. 232 a singleton (20.5 x 15.0 cm) attached to f. 233 with no watermark visible, chain lines at 33 mm (unlike ox head sheets in this gathering with chain lines at 37 mm). Quire 19 (VI + 1), ff. 234-46, ox head with five petals and triangle watermark on ff. 234/246, 236/243, 238/241; f. 245 a singleton (14.0 x 6.3 cm) attached to f. 246 with no watermark visible, but chain lines at 37 mm are similar to those in other sheets of this gathering. Quire 20 (VI), ff. 247-58, ox head with five petals and triangle watermark on ff. 247/258, 250/255, 252/253. Quire 21 (VI), ff. 259-68 plus two blank, unfoliated leaves, ox head with five petals and triangle watermark on ff. 259/, 262/267; ox head with seven petals and triangle, ff. 264/265. Quire 22 (VI), ff. 269-80, ox head with five petals and triangle watermark on ff. 269/280, 272/277, 274/275. Quire 23 (VI + 2), ff. 281-94,  ox head with five petals and triangle watermark on ff. 281-98, 283-90, 286-87; f. 291 a full-sized singleton attached to f. 292 with no watermark visible; f. 294 a full-sized singleton attached to f. 293 with ox head with five petals and triangle watermark. Quire 24 (IV + 1), ff. 295-302 plus three blank, unfoliated leaves, ox head with five petals and triangle watermark on ff. 296/, 299/302, 299/302; f. 298 a singleton (15.0 x 16.0 cm) attached to f. 299, ox head with five petals and triangle watermark. 3. Ox head with six petals: Piccard Ochsenkopf XII316 (Oberschwaben, 1471). We have not found this watermark elsewhere in Regiomontanus’s autographs. 4. Balance in circle (a): Piccard Waage V254 (Süddeutschland, 1453). Balance in circle watermarks appear on Regiomontanus’s paper more frequently than do any other motives. And with only one exception, all of the codices with balance in circle paper were written before Regiomontanus left Vienna, i.e., before 1462. Waage V254 does not appear in any of these codices; however, Piccard Waage V254-V308 are very similar marks, many of which do appear in Regiomontanus’s oeuvre. 5. Balance in circle (b): Piccard Waage V292 (Nürnberg 1460). A similar watermark appears in Regiomontanus’s autograph ÖNB lat. 5179 (dated 1459). 6. Balance: Piccard Waage I34 (Udine, 1448). This mark appears only in ÖNB lat. 4988, ff. 51-52 (ephemerides for 1454). A closely related mark, Piccard Waage I38? (Wiener Neustadt, 1472) appears in ÖNB lat. 4988, ff. 101-12 (horoscopes for 1457). No other balances without surrounding circle or lines appear in Regiomontanus’s autographs. 7. Balance in circle (c): similar to Piccard Waage V279 (Wiener Neustadt 1450-51). Similar watermarks (Waage V277 – V280) appear in ÖNB lat. 4988 (dated 1452-53, 1461-62) and ÖNB lat. 5203 (dated 1456-62). 8. Ox head with five petals and triangle: Piccard Ochsenkopf XII809 (Innsbruck, Augsburg, Schwerin, 1470-75). A very similar watermark appears in Munich, Bayerische Staatsbibliothek (henceforth BSB) Rar 299a, an autograph of Regiomontanus’s ephemerides for 1472. We have not found this watermark elsewhere in Regiomontanus’s autographs. The paper comprising the manuscript falls three distinct periods. Books 1-2, through f. 29, were written on paper used by Regiomontanus around 1462, early in his Italian sojourn. Books 3-8, through f. 150, were written on paper that Regiomontanus had used during his student years in Vienna, i.e., before September 1461. It seems unlikely, however, that he would have written those books before leaving Vienna; perhaps Regiomontanus took some Vienna paper along to Italy? Books 9-13, from ff. 151-302, were written on paper used by Regiomontanus in 1471-72, after he had moved to Nuremberg. After Regiomontanus’s death in 1476, his Nuremberg partner Bernhard Walther purchased from the heirs all his books plus some astronomical instruments. Judging from later complaints, Walther apparently kept the books under lock and key, refusing to let anyone see them. Dying in 1504, Walther had instructed his heirs to sell all his books to endow a perpetual mass for the families of Regiomontanus and Walther in Nuremberg’s St. Sebald church. In 1512 the librarian at the new university in Wittenberg write friends in Nuremberg, asking whether Walther’s books were still available. In response, the prominent Nuremberg patrician and humanist, Willibald Pirckheimer, prepared an inventory of the 187 codices still in the collection, including a Defensio Theonis. However none of the books went to Wittenberg, and in 1519 the Nuremberg City Council purchased most of Walther’s books for their Ratsbücherei. A 1522 inventory of that library lists a Defensiones Theonis contra Trapesuntium scripte in Bapiro. Preservation, apparently, was not the only goal of the Ratsbücherei, for in 1524, Pirckheimer purchased “for a great price” three codices containing lengthy Regiomontanus autographs, including his work on triangles, his commentary on Ptolemy’s Geography, and the Defensio (these three autographs are all now in St. Petersburg). Intending to edit and publish all three texts, Pirckheimer in 1525 did print Regiomontanus’s Geography commentary, announcing in the preface that the Theonis contra Trapezuntium defensionem would also soon be published. Yet Pirckheimer died in 1530, and the Defensio manuscript remained, unpublished, in his personal library in Nuremberg. The existence of Regiomontanus’s text, however, had been publicized in print and continued, for a few years, to attract notice. In 1536, Johannes Schöner, mathematics teacher at the Nuremberg Gymnasium and publisher of many Regiomontanus texts including On triangles of every sort (from the Pirckheimer manuscript), announced his intention to print the Defensio. Yet Schöner died in 1547 without realizing this goal. In 1548, a notice of the Defensio appeared in a massive bibliography published by Konrad Gesner, a physician and philologist in Zurich. In 1549, when Erasmus Reinhold, professor of mathematics in Wittenberg, delivered an oration on Regiomontanus—the earliest, still extant biographical compendium—he referred to the latter’s “most vehement disputes with Trebizond, whose reveries in criticizing Theon he refuted ingenuously.” Reinhold also repeated the rumor that Trebizond’s sons had poisoned Regiomontanus, “because he had criticised the latter’s translation of Ptolemy and refuted the errors in his commentary and his criticism of Theon.”  Despite such brief comments, we have found no evidence of any sixteenth-century reader, after Pirckheimer, trying to gain access to the text of Regioimontanus’s Defensio. Fig. 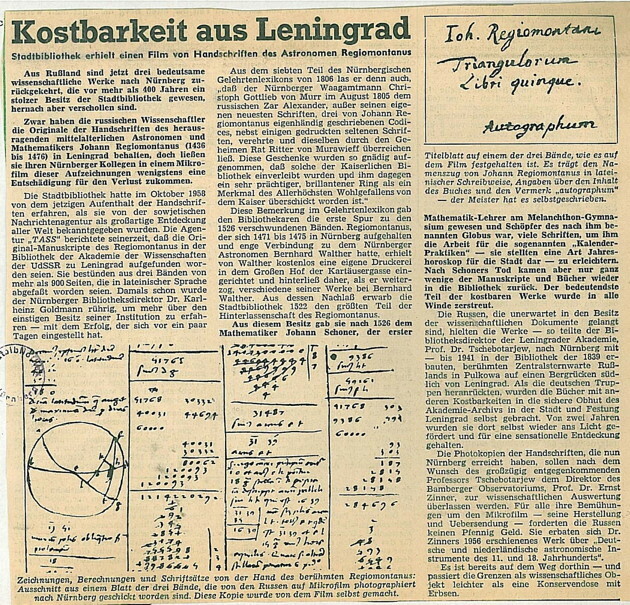 2: Announcement of the discovery of the Regiomontanus autographs in Leningrad. Nürnberger Zeitung, October 2, 1958, 2. Courtesy of the Nuremberg Stadtbibliothek. Fig. 3: Announcement of the arrival of the microfilms of the Regiomontanus autographs in Nuremberg. Amtsblatt der Stadt Nürnberg, June 1, 1960, 2. Courtesy of the Nuremberg Stadtbibliothek, Nor. J.B. 443, Bl. 111. Fig. 4: Announcement of the arrival of the microfilms. Nürnberger Nachrichten, June 1, 1960. The reproduction at the lower left is from f. 298r of the Defensio autograph. Courtesy of the Nuremberg Stadtbibliothek, Nor. J.B. 443, Bl. 107a. In the second, enlarged edition of his Regiomontanus biography (1968), Zinner summarized his 1962 article without adding anything more about the content of the Defensio. Zinner, who would die in 1970, stimulated the rediscovery of the Regiomontanus autographs in Leningrad and their filming for use at the Nuremberg Stadtbibliothek. He did not, however, study their content in any detail. To the best of our knowledge, no scholars since 1960, using either the original in St. Petersburg or the film in Nuremberg, have analyzed Regiomontanus’s Defensio. In the summer of 1994, working with the Nuremberg photostatic copy, Shank began transcribing from the Defensio passages relevant to his edition of Regiomontanus’s Disputationes, and began to realize the former’s significance for Regiomontanus’s physical views. In 1996, we secured a black-and-white photocopy of the complete manuscript from the St. Petersburg Archive of the Russian Academy of Sciences. Grants from the National Science Foundation in 1998-2001 enabled us to start to study the Defensio and its subsequent history. In 1999, Shank was appointed to a five-year, half-time senior membership at the Institute for Research in the Humanities at the University of Wisconsin-Madison to transcribe the manuscript. With further support from the National Science Foundation, Kremer in 2002 launched a collaborative project with the St. Petersburg Archive to produce high-resolution, full-color digital scans of the manuscript. These scans, plus Shank’s preliminary transcriptions, comprise the basis for this first publication of Regiomontanus’s Defensio. It has been, one might say, a long time in the making. In 1801, Christoph G. von Murr described the manuscript as having 573 pages. An inventory in the St. Petersburg Archives of the Russian Academy of Sciences, dated 14 September 1940 and describing the transfer of the three Regiomontanus autographs from the Pulkowa Observatory to the Academy, lists IV-1-937 as having 296 folios. 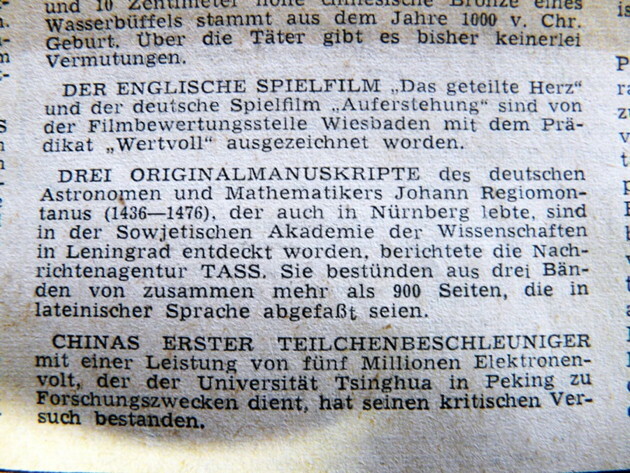 The microfilm of the manuscript prepared in 1960 for the Nuremberg Stadtbibliothek shows bottom left foliation, uncanceled upper pagination, and no foliation at the upper right. See Christoph G. von Murr, Notitia trium codicum autographorum Iohannis Regiomontani in bibliotheca Christophori Theophili de Murr (Nuremberg: Wolf Penker, 1801), 8; Richard L. Kremer, "Text to Trophy: Shifting Representations of Regiomontanus’s Library," Lost Libraries: The Destruction of Great Book Collections Since Antiquity, ed. James Raven (London: Palgrave Macmillan, 2004), 75-90. Already in the eighteenth century, a catalogue noted: “Plagulae priores sunt mutilae.” Biblioteca Christ. Joach. Halleri de Hallerstein ... publicae auctionis lege inde a mense Jul. a. 1798, 2 vols (Nuremberg: no publ., 1798), ii:511. Regiomontanus marked Quire 4 as starting at f. 40. Perhaps the singletons of Quire 3 were rearranged during binding. Quire 24 is marked in pencil as starting on f. 294, but the 24 is canceled in pencil. Ingeborg Neske, Die Handschriften der Stadtbibliothek Nürnberg, Bd. V: Die lateinischen mittelalterlichen Handschriften, Varia, 13.-15. und 16-18. Jahrhundert (Wiesbaden: Harrossowitz Verlag, 1997), 52. However Nür Cent. V, 60, with Regiomontanus annotations and ex libris, Vienna (? ), dated 1468 and said by Neske, Handschriften V, 96, to have been acquired by Regiomontanus either in Hungary or Nürnberg, is also bound by Mathias. Perhaps this codex had been bound in Vienna before Regiomontanus acquired it? The watermark in the manuscript matches the shape and dimensions of XII431 (Nördlingen variant), but its overall length is about 103mm, in contrast to the 119-120mm of XII431. Elmar Hertrich, ed., Bayerische Staatsbibliothek Inkunabelkatalog, 6 vols. (Wiesbaden: Ludwig Reichert Verlag, 1988-2005), P-399, P-400, R-60. Balance in circle paper can be found in the following Regiomontanus autographs, dated by Neske or Zinner primarily by the content of the texts rather than codicological considerations: Nür Cent. V, 15 (1462), Nür Cent. V, 55 (1460), Nür Cent. V, 62 (1460), Nür Cent. VI, 13 (1460), Nür Cent. VI, 18 (1452), Nür Cent. VI, 23 (1452? ), ÖNB lat. 4756 (1450? ), ÖNB lat. 4988 (1448-1462), ÖNB lat. 5179 (1459), ÖNB lat. 5203 (1456-62), ÖNB lat. 5208 (? ), ÖNB lat. 5496 (1967-70), Seitenstetten 2°53 (1460). See Ernst Zinner, Leben und Wirken des Joh. Müller von Königsberg genannt Regiomontanus, 2d rev. ed. (Osnabrück: Zeller Verlag, 1968), passim. Hertrich, ed., BSB-Ink R-60, R-68. See Zinner, Regiomontanus, 311-12, 364. Kremer has personally examined all these codices; for the paper used in Regiomontanus’s Nuremberg print shop, see Angelika Wingen-Trennhaus, "Regiomontanus als Frühdrucker in Nürnberg," Mitteilungen des Vereins für Geschichte der Stadt Nürnberg 78 (1991): 17-87. To avoid confusion, we have not translated Piccard’s nomenclature for the watermark motives. Zinner, Regiomontanus; Neske, Handschriften V; Hans Thurn and Otto Stählin, Die griechischen Handschriften der Universitätsbibliothek Erlangen (Wiesbaden: Harrassowitz, 1980); Murr, Notitia trium codicum; Antonio Rigo, "Bessarione, Giovanni Regiomontano e i loro studi su Tolomeo a Venezia e Roma (1462-1464)," Studi Veneziani 21 (1991): 49-110. This manuscript contains an autograph copy of De triangulis omnimodis, known (from dated evidence) to have been composed by Regiomontanus from 1462-64 while he was in Italy. However, the paper in St. Petersburg IV-1-936 dates slightly later (crossed arrows, Piccard IX 954-64, Udine 1463-67), and the copy is extremely clean, unlike the Regiomontanus’s heavily revised draft in St. Petersburg IV-1-935. Presumably IV-1-936 was a clean copy prepared for a printer; indeed, the manuscript shows casting off marks, in pencil, and ink-smudged fingerprints, and undoubtedly was used in the print shop for Johannes Schöner’s 1533 edition (Nuremberg: Johann Petreius). Lotte Labowsky, Bessarion's Library and the Biblioteca Marciana: Six Early Inventories (Rome: Edizioni di Storia e Letteratura, 1979), 120-22. Reading vitio for vicio. Felix Schmeidler, ed., Joannis Regiomontani, opera collectanea (Osnabrück: Zeller Verlag, 1972), 533. Regiomontanus’s marginal note, “Hoc prius scribe” (f. 189r), was intended to place two quotations from Ptolemy in the right order. The imperative “write this earlier” suggests the he was planning to recopy, or more likely to have a scribe recopy, his manuscript in order to obtain a fair copy from which to set type. H. Petz, "Urkundliche Nachrichten über den literarischen Nachlass Regiomontans und B. Walthers 1478-1522," Mitteilungen des Vereins für Geschichte der Stadt Nürnberg 7 (1888): 237-62. “Opus astronomicum incompletum,” Stadtbibliothek Nürnberg, Pirckheimer-Papier 364, Umschlag 14, Blatt 3. See Kremer, “Regiomontanus’s Library,” n. 6. “1522 adi 1. Octobris sind Bernhardem Walthers seligen pucher verhanden gewest, wie Gleich volgt,” Staatsarchiv Nürnberg, Reichsstadt Nürnberg, Landpflegeamt, Gemeinakten 152, Nr. 5, 4 folios, edited in Petz, "Urkundliche Nachrichten," 247-62. Pirckheimer to Johannes Oecolampadius, 23 January 1524, in Emil Reicke, et al., ed., Willibald Pirckheimers Briefwechsel, 7 vols. (Munich: Beck, 1940-2009), v:112-14; Ptolemy, Geographicae enarrationis libri octo, Bilibaldo Pirckeymhero interprete, annotationes Ioannis de Regiomonte in errores commissos a Iacobo Angelo in translatione sua (Strassburg: Iohannes Grieningerus, 1525), sig. a2v. Regiomontanus, De triangulis omnimodis libri quinque, ed. Johannes Schoener (Nuremberg: Johann Petreius, 1533); Johannes Schöner, Tabulae astronomicae, quas vulgo, quia omni difficultate & obscuritate carent, resolutas vocant (Nuremberg: Johann Petreius, 1536), sig. V2r-v; Conrad Gesner, Pandectarum sive partitionum universalium ... Libri xxi (Tigurini: Christophorus, 1548), f. 88r ("Adversus commentarios & versionem G. Trapezuntij in Almagestum, Io. de Regiomonte"); Erasmus Reinhold, Oratio de Ioanne Regiomontano mathematico, in renunciatione gradus magisterij philosophici, ed. Philipp Melanchthon (Wittenberg: Vitum Creutzer, 1549), sig. a6r, a8v-b1r, translated in Sachiko Kusukawa, ed., Philip Melanchthon: Orations on Philosophy and Education (Cambridge: Cambridge University Press, 1999) 242, 45. Reinhold claimed to have based his speech on an earlier oration by Johannes Schöner, which has not been found. William Henry Black, Catalogue of the Arundel Manuscripts in the Library of the College of Arms (London: Bentley, 1829); H.F. Massmann, "Wilibald Pirkheimers Bibliothek in England," Bayerische Annalen für Vaterlandskunde 3 (1835): 61-63; Emile Offenbacher, "La bibliothèque de Wilibald Pirckheimer," La bibliofilía 40 (1938): 241-63; Leona Rostenberg, "The Libraries of Three Nuremberg Patricians, 1491-1568," The Library Quarterly 13 (1943): 21-33. Johann Heumann, Documenta literaria (Altdorf: Lavr. Schupeel. Acad. Bibl., 1758), a3v-a4v; Friedrich Heerdegen, Catalogue des manuscrits de la succession de Wilibald Pirckheimer faisant partie de la collection e Monsieur le Baron Sigesmond Chret. Joaquim Haller de Hallerstein ... qui seront vendus à l'enchère et au comptant le 28 Janvier 1861 et les jours suivante à Nuremberg (Nuremberg: Campe, 1861); Reicke, ed., Pirkheimers Briefwechsel, i:vii-xviii; Heinz Zirnbauer, Die Haller von Hallerstein, eine Nürnberger Patrizierfamilie im europäischen Raum: Ausstellung der Stadtbibliothek Nürnberg (Nuremberg: Stadtbibliothek, 1961); Horst Pohl, ed., Williband Imhoff, Enkel und Erbe Willibald Pirckheimers (Nuremberg: Selbstverlag des Stadtrats zu Nürnberg, 1992); Michael Diefenbacher and Rudolf Endres, eds., Stadtlexikon Nürnberg, 2d improved ed. (Nuremberg: W. Tümmels Verlag, 2000), s.v. "Imhoff, Willibald." According to prices recorded in the copy of Biblioteca Christ. Joach. Halleri de Hallerstein, ii:511 (now in the family archive at Schloss Großgrundlach, just north of Nuremberg), Murr purchased two printed books and 10 manuscripts from the estate, paying 1 gulden 20 kreuzer for the Triangles autograph, 3 gulden 15 kreuzer for Annotations, and 2 gulden for the Defense of Theon. We thank Berthold Haller von Hallerstein for kindly allowing Kremer to consult materials in his family archive. For a contemporary account of the Haller von Hallerstein collections, see Friedrich Karl Gottlob Hirsching, Versuch einer Beschreibung sehenswürdiger Bibliotheken Teutschlands, 4 in 6 vols. (Erlangen: Palm, 1786-91), iii/1:154-58. Christoph G. von Murr, Anmerkungen über Herrn Leßings Laokoon, nebst einigen Nachrichten die deutsche Litteratur betreffend (Erlangen: Wolfgang Walther, 1769), 47-60; Christoph G. von Murr, "Vertraute biedemännische Briefe Albrecht Dürers an den berühmten Rathsherrn Wilibald Pirckheimer in Nürnberg," Journal zur Kunstgeschichte und zur allgemeinen Litteratur 10 (1781): 3-48; Christoph G. von Murr, "Amplissima collectio operum Iohannis Regiomontani," Journal zur Kunstgeschichte und zur allgemeinen Litteratur 17 (1789): 356-63; Martha List, Die handschriftliche Nachlaß der Astronomen Johannes Kepler und Tycho Brahe (Munich: Verlag der Bayerischen Akademie der Wissenschaften, 1961); Christoph von Imhoff, ed., Berühmte Nürnberger aus neun Jahrhunderten, 2d expanded and enlarged ed. (Nuremberg: A. Hofmann, 1989), 225-27. “Herrliche Autographa Regiomontani (inedita?) besitzt v. Murr in Nürnberg; er meldet uns, dass er sie im dritten Theile seines neuen Literatur-Journals beschreiben werde. ‘Ich weiss nicht’, schreibt v. M. ‘was für Schicksale meine herrliche Autographa Regiomontani et alia haben werden, die ich nicht gern für 100 Ducaten geben würde.” Franz Xavier von Zach, Allgemeine geographische Ephemeriden 4 (1799): 171. See Murr to von Zach, 10 October 1799, in idem, 382. Murr would attach the engraved copy to his 1801 published description of the three autographs (see Defensio, ff. 43r, 44r). Murr, Notitia trium codicum, 11-19; Iohannis Regiomontani tres codices chartacei autographi, in forma quarta, in bibliotheca C.T. de Murr Norimbergae (s.l. : ); Christoph G. von Murr, "Aus einem Schreiben C. G. von Murr's," Monatliche Corespondenz zur Förderung der Erd- und Himmels-Kunde 8 (1803): 474-75; Joseph Jérôme LeFrançois La Lande, Bibliographie astronomique [Paris, 1803], facs. reprint ed. ed. (Amsterdam: J. C. Gieben, 1970), 658, 858. Casimir Lemmerich, Geschichte der evangelisch-lutherischen Gemeinde St. Petri in St. Petersburg (St. Petersburg: Gustav Haessel, 1862). Into his personal copy of Tres codices, now in Nuremberg, Bibliothek des Germanischen Nationalmuseums, 4° W755, Murr wrote: “Anno 1805 in Iulio dono misi Alexandre I, Imp. Russ. qui me donavit in Iul. 1806 annulo pretiosissimo cultra 2600 [canceled to 2000] flor.” For Murr’s transactions with the Russian czar, see Johann Georg Lampe to Murr, 17/29 March 1805, 10 November 1805; Michael Nikitos Muraviev to Murr, 3 October 1805, Munich, Bayerische Staatsbibliothek, Murriana II; Lampe to Murr, 7 August 1806, Nuremberg, Bibliothek des Germanischen Nationalmuseums, Hist. Archiv, Nachlaß Murr 1. In 1809, Murr described the ring and his modus operandi. Seeking help from the guardian of a large private library assembled in Gotha by Duke Ernst II, Murr offered to trade a rare coin in exchange for assistance in selling the Regiomontanus autographs: “Gerne würde ich Ihnen, verehrtester Herr und Freund! ein Geschenk damit machen [the coin], wenn Sie mir Zum Ankaufe meines Brillantenrings, (von dem ich keinen reallen Gebrauch machen kann, denn bey mir, in meinem 76sten Jahre, hießt es: Omnia Musis confecto. Auch habe ich nie Ringe getragen) den ich als Gegengeschenk für meiner Regiomontana ... vom russischen Alexander I erhielt .... Ich hätte schon 90 Caroline [900 gulden] dafür haben können; aber ich halte ihn für 100. Er hat in der Mitte einen grossen Ruben Spinel, mit 14 Brillanten herum, von herrlichem Messer, jeder wie ein halben Pfenning. Die Fassung ist so schön, daß sie ein Meisterstück zu nennen ist.” Murr to Heinrich Reichard, 15 November 1809, Nuremberg, Stadtbibliothek, Autogr. 1734. For the 5800 books in Murr’s estate, see Johann Ferdinand Roth, Catalogus librorum quos Christophus Theophilus de Murr ... collegerat Noribergae a. MDCCCXII d. VI. m. Aprilis et diebus seqq publicae auctionis lege pro parata pecunia distrahendorum (Nuremberg: Lechner, 1811). Parts of Murr’s story were discovered by Regiomontanus’s most recent biographer, Ernst Zinner, Leben und Wirken des Johannes Müller von Königsberg genannt Regiomontanus (Munich: C.H. Beck'sche Verlagsbuchhandlung, 1938), 191. Otto Struve, Librorum in bibliotheca Speculae Pulcovensis anno 1858 exeunte contentorum catalogus systematicus, 2 vols. (St. Petersburg: Eggers et Socios, 1860-80), i:v-vi. Otto Struve, Beitrag zur Feststellung des Verhältnisses von Keppler zu Wallenstein, Mémoires de l'Académie Impériale des Sciences de St.-Pétersbourg, vii sér., tome 2, nr. 4 (St. Petersburg: Eggers et Comp, 1860); Maximilian Curtze, "Uber eine neue Copernicus-Handschrift," Altpreussische Monatsschrift 10 (1873): 155-62; Maximilian Curtze, "Über das Exemplar der Ephemeriden des Johannes Stöffler von 1531 mit angeblichen Noten von des Copernicus Hand," Altpreußische Monatsschrift 11 (1874): 278-79. Zinner to Valentin L. Tschenakal, 29 September 1958, Frankfurt aM, Institut für Geschichte der Naturwissenschaften, Zinner Nachlaß. We thank David King and Ryszard Dyga for making available materials from this Nachlaß. For more on Zinner’s complicated relations with the NS regime and the post-war German government, see Freddy Litten, Astronomie in Bayern 1914-1945 (Stuttgart: Steiner, 1992); Kalrheinz Schaldach, "Das Ernst Zinner-Archiv," Ad radices: Festband zum fünfzigjährigen Bestehen des Instituts für Geschichte der Naturwissenschaften der Johann Wolfgang Goethe-Universität Frankfurt am Main, ed. Anton von Gotstedter (Stuttgart: Steiner, 1994), 25-28; Robert S. Westman, "Zinner, Copernicus and the Nazis," Journal for the History of Astronomy 28 (1997): 259-70; Silke Ackermann, "Dormant Treasures: The Zinner-Archive at Frankfurt University," Nuncius 16 (2001): 711-22. Valentin L. Chenakal, Watchmakers and Clockmakers in Russia, 1400 to 1850, trans. W. F. Ryan (Ramsgate: Antiquarian Horological Society, 1972); Valentin L. Chenakal, "John Bradlee and his Sundials," Journal for the History of Astronomy 4 (1973): 159-67. Tschenakal died in 1977. See Journal for the History of Astronomy 8 (1977): 222. Nürnberger Zeitung, 2 October 1958, 2. Zinner to Tschenakal, 29 September 1958, Zinner Nachlaß. Zinner to Goldmann, 5 February 1960. Nuremberg, Stadtbibliothek, Handschriftenabteilung, Goldmann Nachlaß. Many other letters, dated from 1958-60, concerning the Regiomontanus autographs are in this Nachlaß. Tschebotarjow to Goldmann, 21 March 1960; Goldmann to Tschebotarjow, 20 May 1960; Goldmann to A. Staudt, 23 May 1960, all in Goldmann Nachlaß; Karlheinz Goldmann, "Drei wertvolle wissenschaftliche Werke kehren in die Nürnberger Stadtbibliothek zurück," Amtsblatt der Stadt Nürnberg, June 1, 1960, 2. This article also appeared in the Fränkische Tagespost Nürnberg, 1 June 1960. 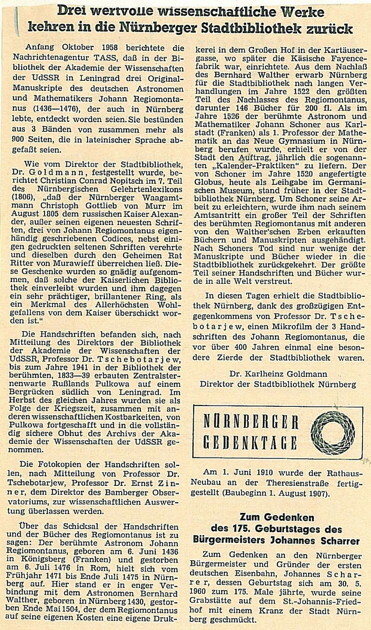 A different report, with the final comment about borders, was published as “Kostbarkeit aus Leningrad,” Nürnberger Nachrichten, 1 June 1960. Ernst Zinner, Deutsche und niederländische astronomische Instrumente des 11. - 18. Jahrhunderts (Munich: Beck, 1956). Ms. facs. 4 and 5, Nuremberg, Stadtbibliothek. Ernst Zinner, "Tri rukopisi regiomontana iz arkhiva akademii nauk sssr," Istoriko-astronomicheskiye issletsovaniya 8 (1962): 373-80; Ernst Zinner, "Einige Handschriften des Johann Regiomontan," Bericht des Historischen Vereins für die Pflege der Geschichte des ehemaligen Fürstbistums zu Bamberg 100 (1964): 315-23, at 315. We cite from the German version. The Ikoscop was a small, portable viewer for 35mm slides and film, made by Zeiss in the early 1960s. Michael H. Shank, "Regiomontanus and Homocentric Astronomy," Journal for the History of Astronomy 29 (1998): 157-66.